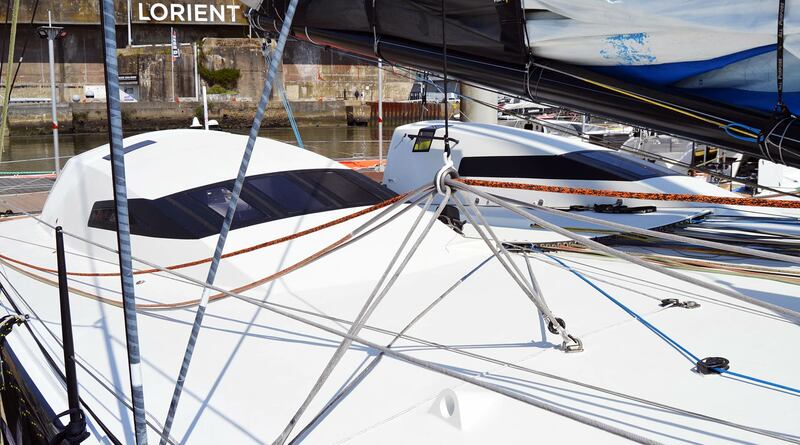 There are seldom places where you might feel a true heartbeat like a strong vibration in the air and if sailing in France has a headquarter then it is for sure here in Lorient. After my visit to Jean-Pierre Kelbert and his JPK Composites yard (read the full article here) the day was still young and I was keen on seeing Lorient pier side – called “La Base”, the Base. I have read about it and seen it in documentaries on YouTube and I theoretically knew what it was all about, but I swear, nothing could have prepared me for what I experienced at “La Base”! When I arrived, it was best summertime weather you could wish for, the pier side next to the three mighty submarine bunkers from World War 2 was filled. The jetties bristling with colourful yachts of all types, proud sponsors and racer´s names displayed at the streamlined hulls. I entered the area from the North passing by the Eric Taberly Sailing World, a huge Museum dedicated to the French sailing hero (I´ve seen one of his famous boats, the PEN DUICK III in Paris lately, read here). And as soon as I walked – unhindered, without paying a single Cent – I was greeted by a familiar sight. Like it was the most normal thing of the world, I spotted the versant lines and the distinct colours of a Class 40 racing yacht – the Lift 40, Marc Lombard´s latest accomplishment when it comes to this very impressive racing class. 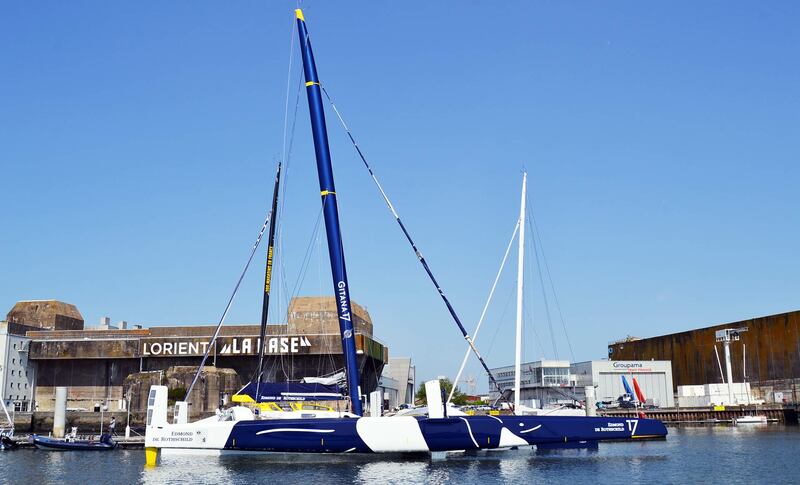 I´ve interviewed Marc on this very boat some months ago (read it here) and now I was excited to be able to seeing this racing yacht face to face – in a hand´s reach. Great to see her in real: The Lift 40 racer by Marc Lombard. 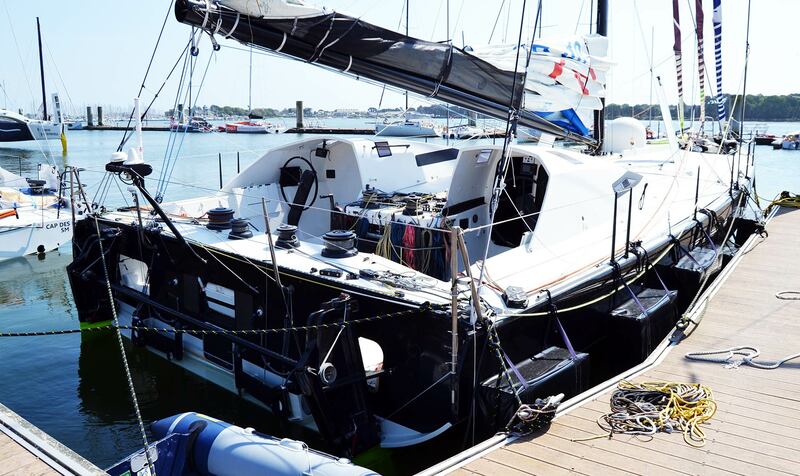 She has the familiar lines astern of all Class 40-boats: Very wide made to plane with ease and race downwind, the 4.50 metres width feature a very narrow freeboard. 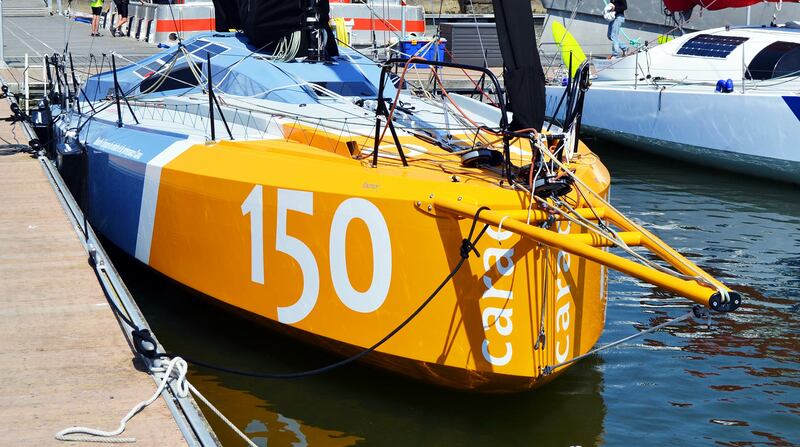 The CARAC with her class´ designation number 150 is skippered by sailor Louis Duc who started his racing career in 2005 with participating in the MiniTransat and in the Solitaire race on Figaro-boats. He finished second in Rolex Fastnet 2011 and 3rd in the Class 40-classement of 2015 Transat Jaques Vabre. 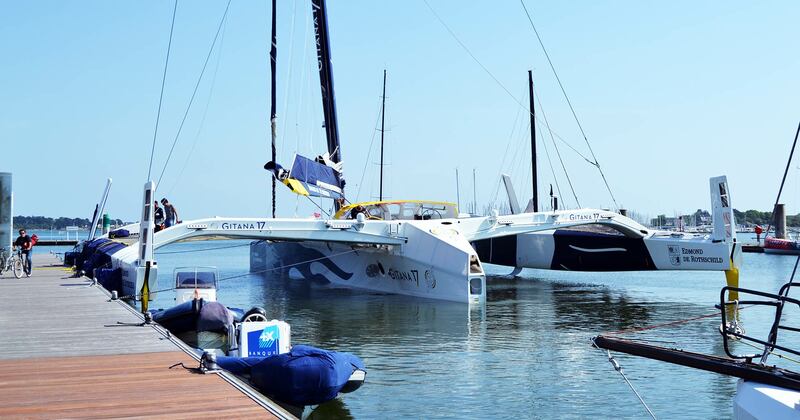 Now, as almost everybody of this fleet, he is inscribed for this year´s Route du Rhum. Marc Lombard´s new approach to better uprind performance: Volume in the bow. 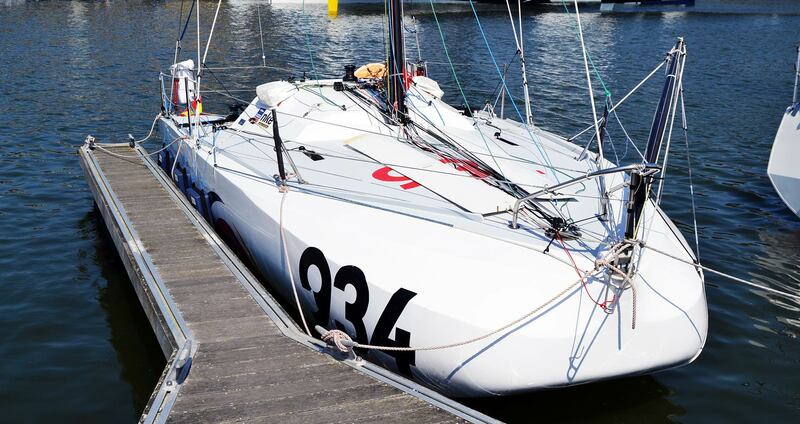 The CARAC is a special Class 40, as I´ve learned from Marc Lombard because she is made to go fast upwind also. When Marc described the features of this yacht from his naval architectural standpoint it all was of course very theoretical – seeing the boat now here mooring right in front of my eyes made these things clearer at an instant: As one can clearly see, the bow section is a lot wider and bears more volume than the traditional, sharp-bowed Class 40 yachts. This should enable the boat to bring more uplifting power and buoyancy to the seas and help to keep her from cutting under incoming waves when beating to windward. Which concept proves being faster? It al gets more clearer when you widen your view and describe the the CARAC to her neighbouring Class 40 boat which seems to be made following the older concepts of Class 40 yachts. As I understood, the Class 40 is a box rule with very strict paragraphs. But by looking at all these boats I understand that within this box the limitations for naval architects for imposing new designs aren´t so tough as I thought. CARAC is a brilliant example for this freedom. I wish Louis Duc all the best for his upcoming races! Speaking of comparisons, one jetty further on another very interesting view opened up: A Class 40 racing yacht was mooring next to a Mini 650. Although I´ve seen Class 40 and Mini-boats on numerous occasions in real life (last time when I visited Alex Lang and his plywood-made 650 – read it here) I´ve never seen them so close together. On Mini 650´s skippers do fantastic things. The most notable of which is the MiniTransat which is taking place on an bi-annual base. Next time in 2019 a fleet of some 80 boats will leave for crossing the Atlantic Ocean on 6.50 metres long boats. I´ve spoken to Lizzy Foreman one year ago who participated in Mini Transat (read it here) and have a high respect for what these small racers and their fearless skippers are accomplishing on their journey. The Classe Mini is also a box rule and a highly respected testbed for new technologies in sailing and racing because it is just not very cost-intensive – starting budgets are as low as 80.000 Euros which is not very high considering the staggering budgets for Volvo Ocean Race or other big offshore races. 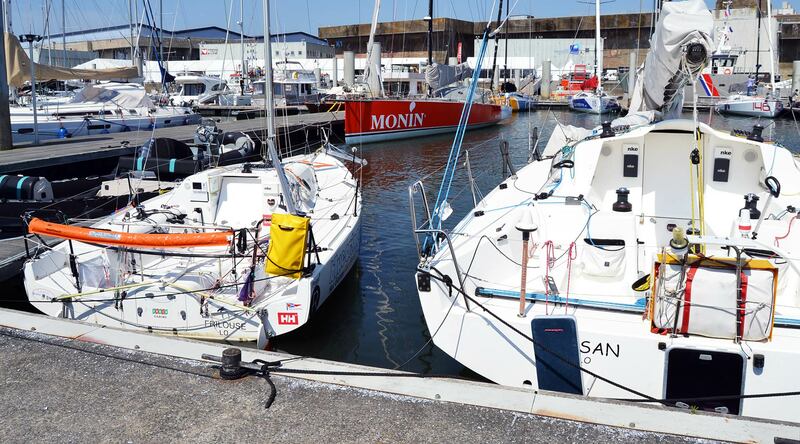 Seeing the small racing dwarf mooring next to her bigger Class 40-sister was an interesting view. I was standing at the Mini´s stern looking at her cockpit for some minutes observing her dozens of lines, sheets and trim-lines. It is sheer unimaginable to reach out into the Atlantic Ocean in such a small boat – even my own King´s Cruiser-yacht is nearly double the size of this boat! But by looking hat these racers I could easily understand the fascination they are radiating. 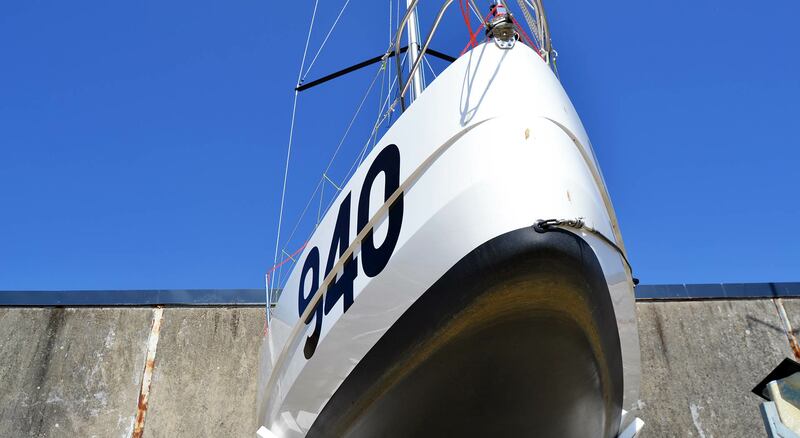 Did I mention that the first canting keel had been tested on such a Mini 650? Class 40 and Open 60 racers are truly the landlords of “La Base” as more than 20 boats had been moored along the jetties when I arrived. One boat was making a nice impression on me, the 139 ADDICTIF, a Sabrosa 40 built by a small workshop of the same name. I liked her fine aft lines and the sharp bow (yes, the classy looks!) and the not too exaggerated dodger-design. One boat further along the jetty the first Open 60 was gently sweeping at the pier side. The boat beared the name MONIN and was an old Open 60 design for she didn´t had the IMOCA 60-typoical outrigger. Unfortunately I couldn´t find anything about this particular boat on the net but judging from her general appearance (especially the worn out dodger that seemed to have got some serious beating by spray and waves) she must have ridden out a number of exciting races in her sailing life. Comparing Class 40 to Open 60 was a no brainer here at the jetties of “La Base” and so I ran back and forth between these two classes to have a first hand look on details like the steering mechanisms, which, essentially, are all but the same from a constructional standpoint: One or two tillers are connected directly via a simple but rigid arrangement of rods to twin rudder blades. Some, like CARAC or this very Open 60 had their blades in a foldaway arrangement – when heeled, the lee rudder can be hung up to not pose any resistance in the water. 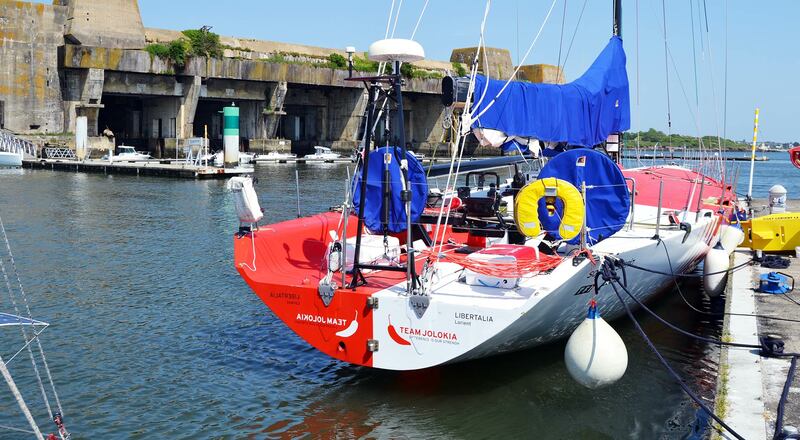 A very nice example of Open 60 IMOCA yacht was the BUREAU VALLEÉ of skipper Louis Burton. From a class´ standpoint she is considered an “old” boat for her building year was 2006 – in the world of pro-racing 12 years is a lot of time and for sure contemporary IMOCA-designs are more modern, but I liked this boat anyway and I was astonished by her great looks and her appearance as if she was brand-new and being built just yesterday. She was sporting a nice, almost “full” bow section, not as sharply edged as one would suspect. The chines start right at the front and will run down all the way to the stern. I observed that the outrigger-shrouds were in fact rigid full-carbon rods – didn´t knew that at all! Inspecting her stern and the wide cockpit, I admired the rounded traveller rail for the main sail which at the same time acted as a kind of entrenchment and marks the border to the open stern of this racer. Imagining this yacht racing downwind with +25 knots this might sport a little more safety-feeling for the crew or the lone skipper. Also, the transparent look-out domes and the small, thick crash-door to the interior raised my interest. 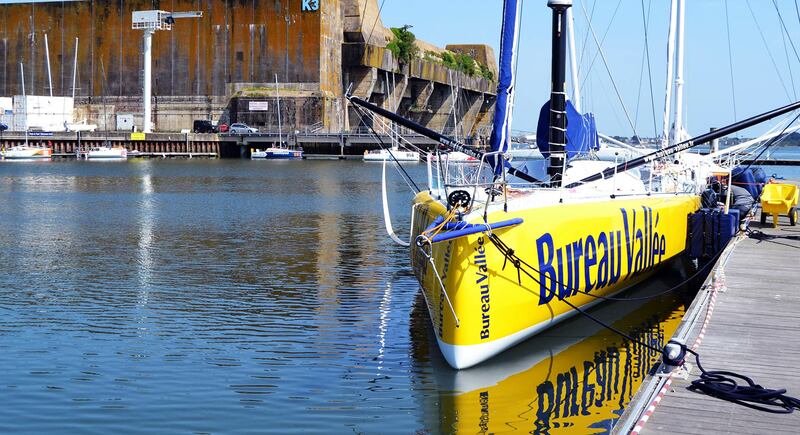 BUREAU VALLEÉ was my first ever IMOCA 60 seen in real life – and I was excited to roam around for minutes. “La Base” is like the pit lane of Formula One in sailing. A lot of teams hafe their workshops here and make “The Base” in the truest sense of the meaning to their headquarter. 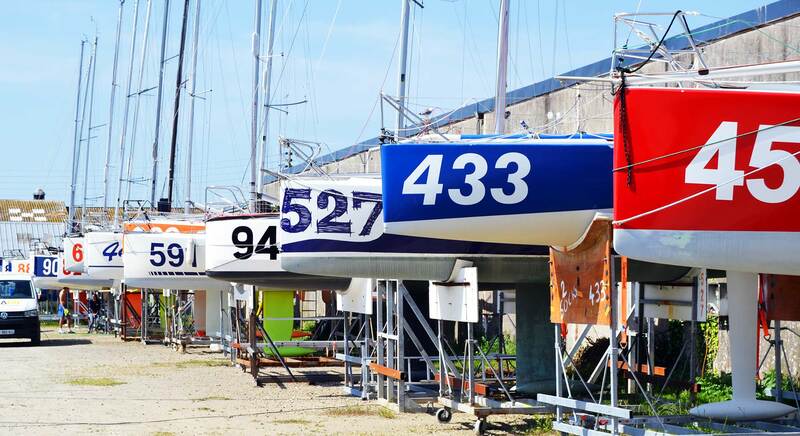 Naturally, the classes and especially the box-ruled-classes are meant to bolster development of new techniques, designs and the utilization of new materials in sailing. So, naturally, some very interesting and sometimes weird looking solutions may come up in the process. Like this one, the SINBAD. I would say she was a 60-footer and looking from ahead she made a pretty normal impression on me. But rounding her stern and looking at this boat from behind revealed her true nature as an experimental craft of some sort: She sported almost no (visible) stern section. It seemed that this part of the boat had just been cut off. She had extremely close quarters abaft behind the two steering wheels. The transom was closed off from the water – which is uncommon for a racing yacht. What I found also interesting was her twin-doghouse-configuration. Very streamlined with darkened portholes I couldn´t really understand this construction: Just the starboard doghouse featured an entrance to her interiors, the port side doghouse was just meant as shelter or lookout from inside. 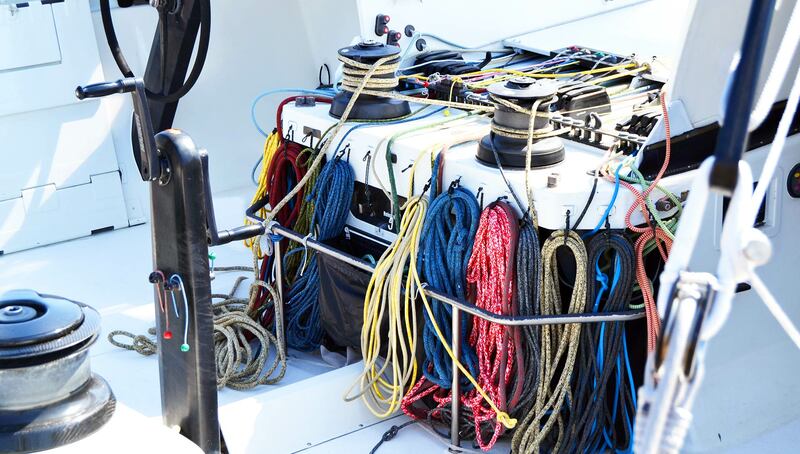 Looking at the layout for the winches, I spotted the clavier of lines in the longitudinal centreline of the boat – but completely unprotected from spray and waves (that´s the good thing of having one continuous dodger or doghouse I would say). The clavier of lines on SINBAD. Better not be tired when working this. Also, a staggering number of lines appear in front with the sheeter looking forward, some lines are diverted to arrive at four massive winches mounted on the even more massive transom – with the sheeter working backwards. I cannot say I really liked nor even understood this design, but as a sailing companion told me once: “Beautiful is what makes you fast!” and that´s the thing with racing machines, the beauty comes with their performance. I also couldn´t find anything about SINBAD on the net and I sincerely hope that her owners and crew do go fast in her indeed. Speaking of going fast – further down the jetty a real monster was moored and let my heart make jumps instantly. No less than the fastest foiling trimaran in the world, GITANA 17 sponsored by Edmond de Rothschild has her home port at “La Base”. Her mast was gently trimmed into a tilted position to port side so that her port-side float was touching water making it possible to go aboard. But not for me, of course, as her crew was busy cleaning and maintaining the boat. She was not off limits with no barriers attached, but I refrained from diverting her crew by asking for a tour. Seeing her from only a few metres distance was exciting enough for sure – she was even dwarfing the mighty bunkers! The GITANA 17 is a Maxi Trimaran just launched last year. Despite the fact that multihulls are indeed very fast sailing vessels, this one is special for that she has no less than six individual appendages – of which most make her “fly”, not literally but practically! Two T-foil rudders at the stern of the floats, one T-foil daggerboard under the central hull and two additional L-shaped foils allow the boat to fully come out of the water and fly at speeds in exceed of 50 knots! 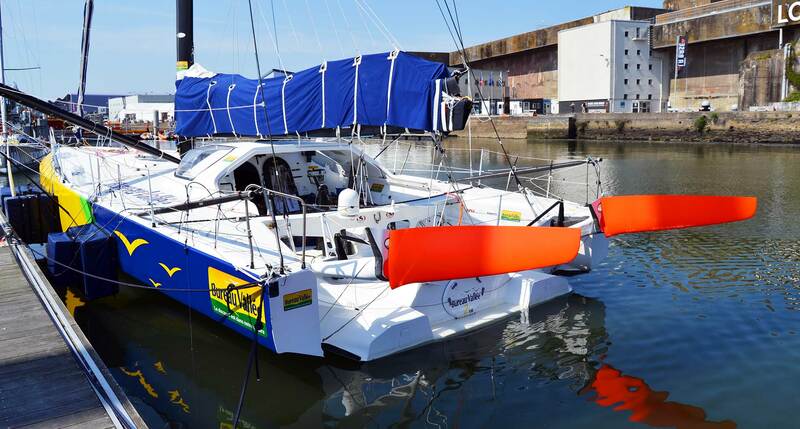 This Trimaran has been built here at “La Base” and is undergoing major sea trials to make her fit to participate in major crewed races as well in solo sailing events. Which instantly brings back memories to unforgotten Chinese sailor Guo Chuan who tragically was lost at sea during a solo sailing record attempt crossing the Pacific Ocean in his 100 feet trimaran (read my interview only days before his final departure here). Nevertheless, looking at this machine of speed was a pretty intensive experience – can you see the light shining through the aft part of the boat? I wish GITANA 17 and her crew as well as her skippers good fortune and always fair winds. For me, as exciting this may look, this is a complete unknown world and I simply cannot imagine the immense stresses that sailing on a vessel like this will pose onto the crew, not to speak on a solo-skipper. In foiling mode, when the boat is stable but a single wave hit in the wrong place could make this monster crash at speeds of 50 knots is a nightmare. For me. Though, it´s at the same time extremely exciting for sure. From a big testbed to the smallest. Have I talked already about the pioneers of the Classe Mini? On a jetty not far from GITANA 17 I spotted an equally awkward looking design: The all-too famous scow bow of a Mini 650. The 334 designated boat is a prototype built back in 1985 named TABAZIN and could be one of the first Mini boats boasting this distinct design. When hard chines was considered one way (and from an aesthetical standpoint it is good that this design has prevailed for sure) the soft chined, wide, rounded scow bow was seen another way. The idea was to create a hull design that could plane and go fast upwind at the same time. Well … beauty lies in the eye of the beholder, right? Here in Germany this is also dubbed “duckbill design” because, well, it just looks like this and upon roaming the vast land-based storage facilities of “La Base” is do spot another scow bow Mini, an Ofcet 6.50 built in La Rochelle not far from here where Dufour Yachts and RM-Yachts have their base – and of course, Amel, which is an upcoming post. The Ofcet 6.50 is a series production boat and although her scow bow isn´t as “excessive” as TABAZIN´s it shows that this concept is far from being put aside. But there aren´t just testbeds and extremes of the modern sailing world to be found at “La Base” for sure. Moored at the very end of one of the jetties I spotted the sharp lines of a more classic design. 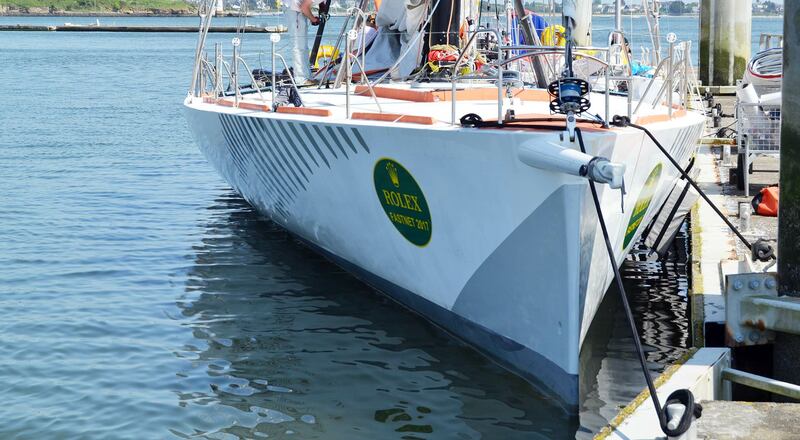 Still bearing proud the stickers of the Rolex Fastnet race a white, extremely V-shaped bow came into sight. Upon nearing the boat I had to admit that she was in a fairly unattended condition but two people were busy in glueing stuff to her daggerboards. Another nice “classic” racing yacht – if this term applies to modern boats – was the Team Jolokia Volvo Ocean Racer. A classy boat with a story. This VO60 is a design of Laurie Davidson. Davidson himself is part of Dibley Marine Design Bureau of Auckland, New Zealand which just recently grabbed the headlines with their Zero-Keel-Design of newly launched Kraken Yachts blue water cruisers. Back to the very boat: This Volvo Ocean Racer had been built by Cookson Boats of New Zealand back in 2001 and participated in this very race 2001/2002. Back then under the name DJUICE DRAGONS skippered under Norwegian flag skippered by Knut Frostad, the boat finished sixth overall out of eight participants. This was the very race when famous German yacht ILLBRUCK won the Volvo Ocean race and this is for the time being the one an only winning title for my country. The DJUICE DRAGONS later won the 2004 edition of Sydney-Hobart and has now been refitted and re-built and participates in races all over France and Europe. I could have stayed here for hours but had to leave eventually of course. As I left the jetties and waved Goodbye to all these fantastic yachts, I looked back upon walking back on solid land. What a great place this is, what an accumulation of so many fantastic, interesting people, all on their path following their dreams and aspirations, “La Base” is the perfect launching pad for them all. The giant slipway where the German U-Boats had been hauled out of water to be repaired. The huge complex was built right after German troops annexed France for the U-Boats, namely the larger types meant for warfare in the far away theaters of war like the Indian Ocean or the Southern Atlantic Ocean. “Keroman”, that was the name for the complex, consisted of a bunkered submarine yard and a tactical bunker for replenishing the boats. A huge slipway was hauling the subs out of water and a big lorry was bringing the boats to sheds – now housing the workshops of the sailing teams. Between the bunkers the free space is utilized for storing the Mini- and Figaro-fleets of Lorient. Giant land storage for the Mini 650 and Figaro-fleet between the bunkers. What I found particularly exciting was the fact that there were no fences whatsoever! You can go there and roam freely, literally plummet into the workshops, say “Bonjour, ca va?” and have a chat with sailors, designers and skippers all along. Nobody wants a fee or hinders you from also living out your passion for sailing and yachts. What a great place to be! 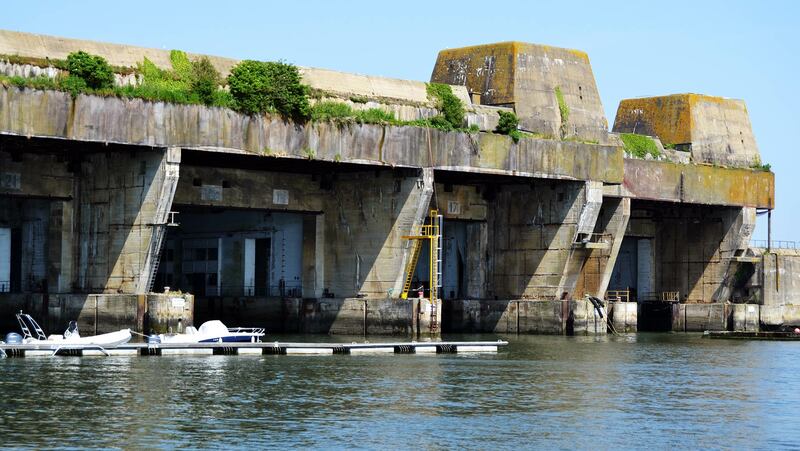 The mighty German Submarine bunkers now serve as workshops for France´s sailing elite. And what a great use for these World War-monsters too. From housing deadly weapons which have brought so much horror and bloodshed to so many people to a Mecca for enthusiastic people, a place where they can meet, talk, work together and live their dreams. Apart from the fact that these bunkers are perfectly suitable for this new task, I find, this is a great example of what human creativity and striving can be, both bringing destruction and death or fun, excitement and joy. In any case, Lorient´s “La Base” is and will remain a vivid memory of a fantastic place every sailor and boat aficionado should pay a visit. Great article as always. I would like to rectify a few facts though. 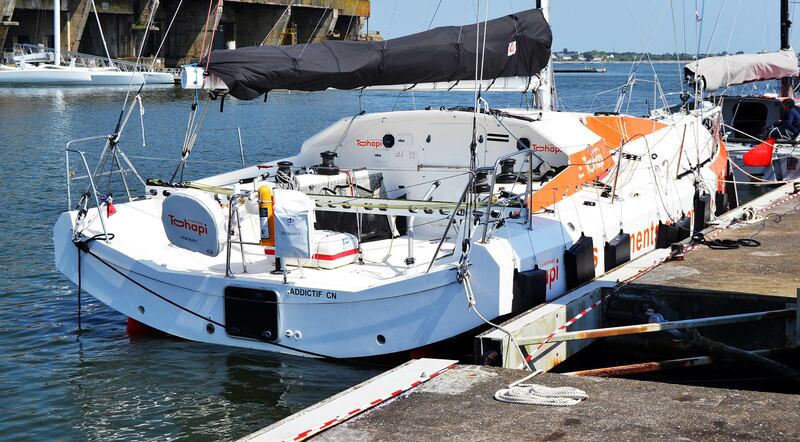 The IMOCA 60 Bureau Vallée 2 (as written on the transom) is pretty new. In fact it is the very boat on which Armel Le Cleach won the 2016/2017 Vendée Globe then named “Banque Populaire 8”. 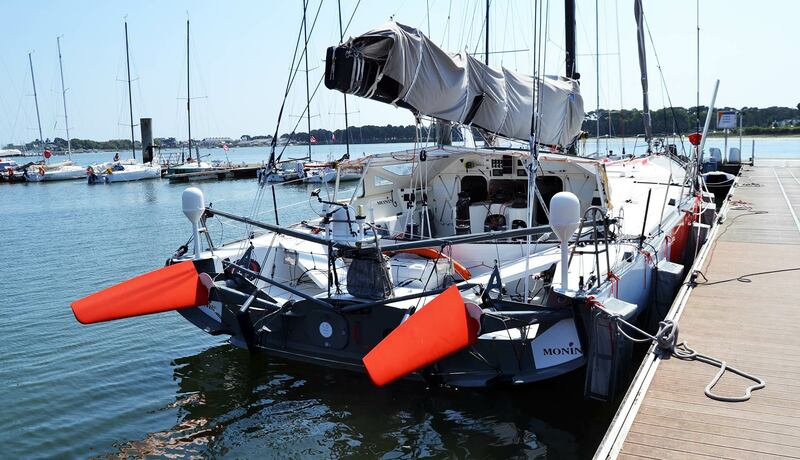 It boasts very modern features such as foils and there are very few others IMOCA more recent than this one on the water to date. 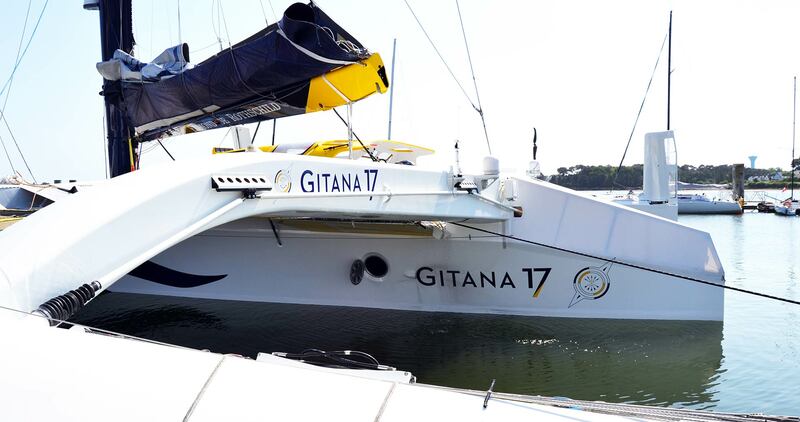 Also, Gitana 17 is about 32m in length which although very big doesn’t make it the biggest trimaran out there. Spindrift 2 is 40m and an older design, which has been excluded from the Ultim class for its length (nowadays 100 ft boats seem to be the sweetspot). thanks for your comment & clarification. Just to let you know that the IMOCA 60 Monin is the former Marc Guillemot’s Safran, the first VPLP Verdier design for the IMOCA class, built for the 2008 Vendée Globe. Sinbad – a Finot-Conq design – was previously known as ‘Hugo Boss’, built for Alex Thomson back in 2007. Thomson had to retire from the 2008 Vendee Globe a few hours after the start, the boat was not completely fixed after its collision with a fishing vessel a month before the start. Bonsoir Cedric, trhanks for the update. So I did in fact stand next to some more celebrities of sailing then. Nice! oh boy, thanks for the Information, I will change the text a bit so that it fits. THANKS for correction here!